Green cleaning is a comprehensive approach to cleaning that combines chemicals, equipment, tools, disposables and communication to produce an effective and safe cleaning program. A green cleaning program is one that combines environmentally preferred products with good sound cleaning procedures, training and expertise. Reduces the risk of cross contamination by identifying use in different departments and surface areas. Choose the right color for your cleaning procedure. 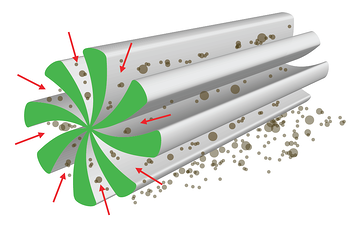 Microfiber works electro-statically so dust and dirt are attracted directly to the mop pad. The accumulated dirt is held tightly within the pad and not redistributed around the room during cleaning. These Microfiber Wet Mops contain a 100% microfiber filler which is more resistant to bacteria than other foam-filled microfiber wet mops, reducing cross contamination. Constructed of 80% polyester and 20% polyamide synthetic fibers. Contains a microfiber filler which is more resistant to bacteria than foam filled products. Does not require any spray treatment. Picks up dirt, dust, and trash electro-statically. 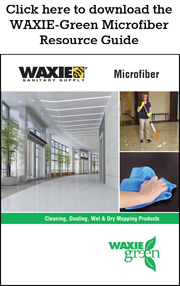 Microfiber performs best when dampened with water or cleaning solution or they can be used dry. Each cloth will lift and trap lint, dust particles, dirt, grease, grime, waxes, and oily residue. Designed for areas where traditional mop bucket-and-wringer mopping or finishing applications are not feasible. Complete self-contained systems makes routine maintenance mopping or laying finish quick and easy.